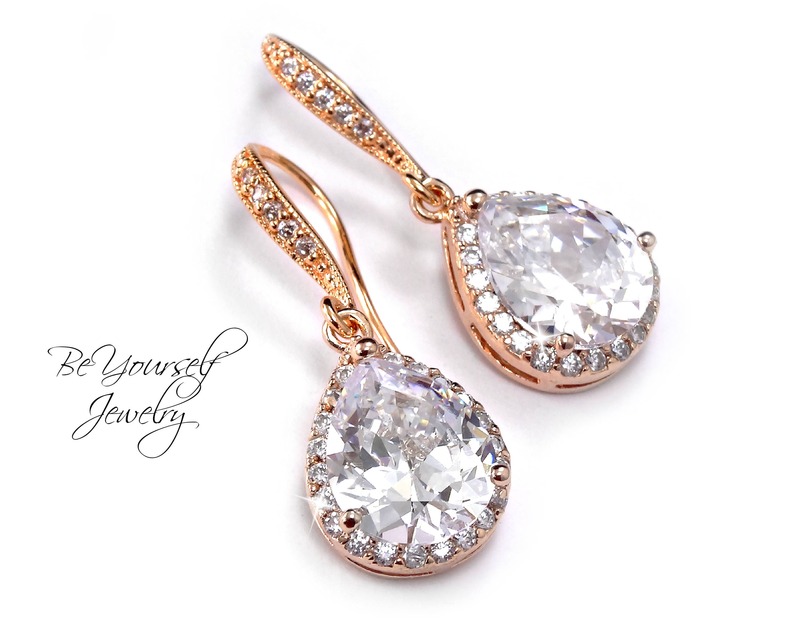 Feminine and very sparkly white crystal and rose gold teardrop earrings made with high quality Cubic Zirconia stones. Perfect for weddings and special occasions. These elegant and beautiful Cubic Zirconia earrings will complement any outfit, specially your wedding dress! The rose gold accents are very romantic and trendy. - This listing is for the Rose Gold jewelry only. The bride is wearing the same design in silver. Also available in silver and yellow gold. Contact us if you would like to order multiple items for your bridesmaids. We are very easy to be reached and usually reply to our messages right away. Special discounts are available for multiple orders. Don't forget to read our FAQ below for more information. * Special thanks to beautiful bride Cathy Hunter who wore this same design in silver at her wedding!